Two pregnant women and 119 others were on Wednesday deported from Libya by the International Organisation for Migration. According to the National Emergency Management Agency, who received them, the 121 persons, had expressed interest to return home. 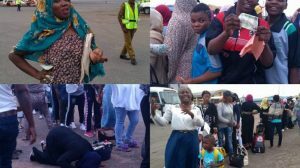 The South-West Zonal Coordinator of NEMA, Suleiman Yakubu, who received them at the Murtala Muhammed International Airport, Lagos, said 121 people were the first batch of people expected in September, warning Nigerians to desist from such experiences. “On arrival, the profiling of the returnees indicates that there are 60 female adults and one girl while male adults are 57 with two male children and a male infant; making a total of 61 females and 60 males. “Among them were two pregnant women and one person with a medical problem,” he said. One of the returnees, Owoade Omolara, narrating her ordeal told newsmen that she spent one year and two months in Libya working as a cleaner in a hospital. According to her, she paid N662, 000 to one trafficker identified as Burger before she was taken out of Nigeria. “When it was time for me to collect my salary, I was accused of stealing and taken to prison and from there the IMO came to rescue me. “There are many Nigerians who travelled the way I did and are still there suffering the same fate,” she said.